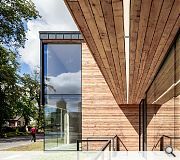 Moxon architects has significantly extended and reconfigured the headquarters of the Cairngorms National Park Authority (CNPA) in Grantown-on-Spey, Scotland on behalf of Reidhaven Estate. 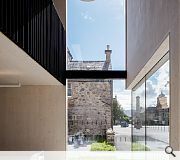 Shortlisted at the Scottish Design Awards 2017 in the Future Building category, the project provides a new public-facing entrance to a nineteenth century building, as well as a new wing of flexible open plan office space and meeting accommodation. 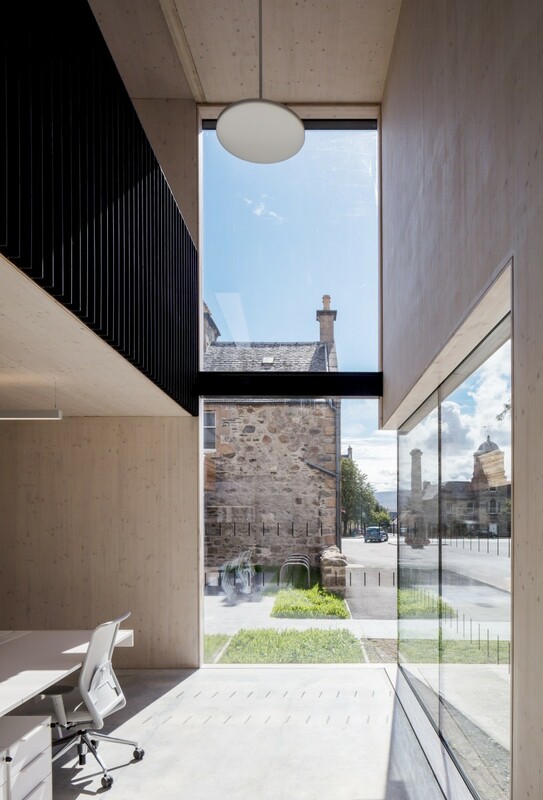 Collaborating closely with The Highland Council through an extensive public planning process, Moxon has created a progressive design in a conservation area that ambitiously rethinks how the CNPA operates and interacts with its public. The new building serves to raise the profile of the CNPA while offering an environment designed to promote collaborative working practices and welcome visitors. 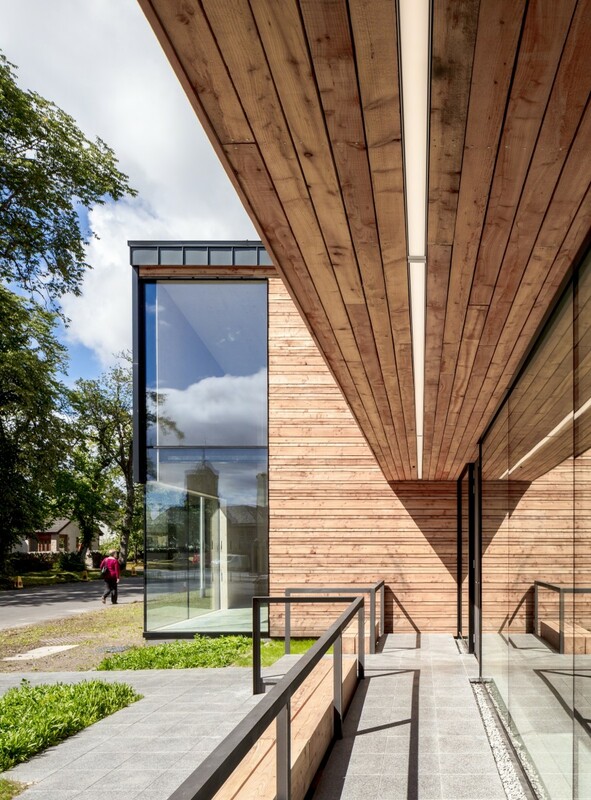 It responds to its context with a structure of exposed cross laminated timber (CLT) clad in natural European Larch, which will weather over time, alongside pleated zinc and frameless glazing. The design approach brings the new building elements to the fore, creating a highly legible new entrance and new wing for the facility. 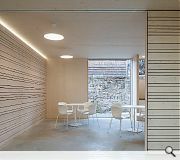 Collaboration, accessibility and the promotion of modern working practices were paramount to the design of the internal spaces, which now provide formal and informal meeting spaces as well as breakout zones while prioritising views of the historic town and landscape. New building elements in effect extend the street around a corner, extrapolating the town grain and complementing existing massing. Traditional materials are deployed in a contemporary idiom to enhance the innate characteristics of the town. Carefully choreographed shifts between new and historic fabric allow the existing built heritage to remain clearly legible. A sequence of simply articulated volumes and frameless glazing creates open plan spaces designed to allow the CNPA to operate more efficiently. Internal areas can be easily reconfigured with movable timber-clad screens that roll out to subdivide the space, offering flexible accommodation for a diverse range of functions including exhibition space and enhanced privacy workstations. 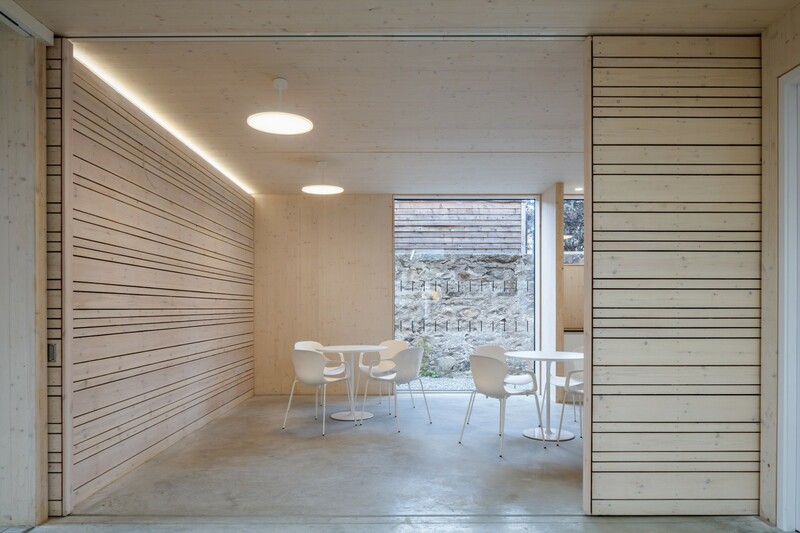 Moxon employed BIM in the design from the outset to maximise efficiency while minimising waste, informing the use of simple and often traditional materials that are combined with a modern approach and meticulous detailing. Adopting a sustainable approach, Moxon’s design addresses the requirements of the brief while looking ahead to future spatial needs to extend the function of the building beyond the typical lifecycle. Layout and orientation is organised to benefit from solar gain, while high levels of insulation and energy efficient windows minimise energy consumption. A range of sustainably sourced materials, wildlife boxes and an intensively planted roof are incorporated seamlessly into the design, ensuring that the special ecology of the site is enhanced by the new building.